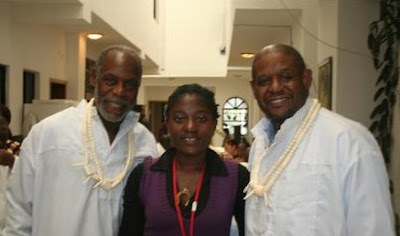 Danny Glover and Forest Whitaker were both made Igbo Chiefs on their recent trip to Nigeria. See the I-Report video and Whitaker's biog which refers to his Akan/Igbo heritage in the Personal Life section. This event does make me wonder: can any foreign celeb turn up and be made a chief in Nigeria, and does being a chief have any real significance if this is true? Or is a chieftancy better understood as merely an honorary title, a bit like being awarded an honorary doctorate in the West? Or, are there all kinds of chieftancies, some meaningful and requiring community duties, and others purely symbolic/honorary? It does seem to be a southern (igbo/yoruba) phenomenon. Were chieftancies more community-oriented in the past (pre-colonialism) and have they become distorted away from this in recent times? It depends, some chieftancy titles are really meant for rulers and what not, some are just honorary. the honorary ones might be to celebrate someone who has done good in a community or that is well respected. Jeremy, as someone already pointed out, some are meant to be honorary, others have a real meaning. MKO Abiola held several honorary titles. However, he was also Aareonakankanfo of Yorubaland. OBJ wanted this title, but out of respect for MKO Abiola, the post has since been vacant. In my humble opinion, the sooner we get away with this sort of insanity (Chief this, Chief Otuba that), the better for out country. There's a nice book called 'Nkrumah and the chiefs' by Richard Rathbone that's a historical, Ghanaian take on your questions. If memory serves, he basically argues that chieftaincy is a really varied institution. There are examples of pretty much every combination of purely ceremonial/powerful, historical/'invented tradition', consultative/tyrannical, well-educated/illiterate and so on. This is a valuable tradition. The Cheiftancy title is an honorable one and yes, there is a distinction between acting Chiefs and honorary Chiefs. This is another case of "Lost in Translation". There is no real way to always effectively translate the distinction & some people (honorary chiefs) have used this to their advantage. The whole thing IS based on community and strengthening the community. If there was a situation that went beyond the Chiefs ability (e.g. natural disaster, or some other distruption to the community), all the Chiefs both active and honorary can be leaned on to support the community. That is why the distinction is not made explicitly. Unfortunately in an increasingly globalized world, loyalty is going out the window. Lots of Chiefs are not performing their duties. It will be interesting to see if Glover and Whitaker would actually come to the aid of their people at their time of need (if it ever came to that). It's tough to explain. Basically, corruption plagued the institution but the value in the institution far outweighs the corruption of a few "fake" Chiefs. All Chieftancy titles are meaningful. They all come with a commitment to the community. In the absence of the actual acting Chief(s) [or in very important matters that concern/affect the whole community; e.g natural disaster], the honourary Chiefs are supposed to come to the aid of the community. All the Chiefs are supposed to be influential members in the community. It is a truly honorable tradition. Of course, there are Chiefs who abuse this position for their personal advancement etc. but the tradition and its value supercedes the "fake" Chiefs. There has been some distortion but the value to the community is still there. I hope Chiefs Glover and Whitaker do not neglect their duties if ever it becomes needed in the community. Is it that hard to grasp? It's like honorary degrees. first time hearing the comparison to honorary degrees, but i guess that would be an apt description. British (Lordship & Ladyship title) Peerage and Baronetage are legally bought and sold for cash. I am all for any money making schemes that puts American dollars in the pockets of our unelected underpaid traditional rulers. For God's sake there's a recession in Naija and Oba's and Obi's have to feed their many wives and dozens of children and put petrol in their Morris Minor. "I am thinking of adopting one myself - Ogbu Oke I of Umuawa Alaocha....killer of rats"